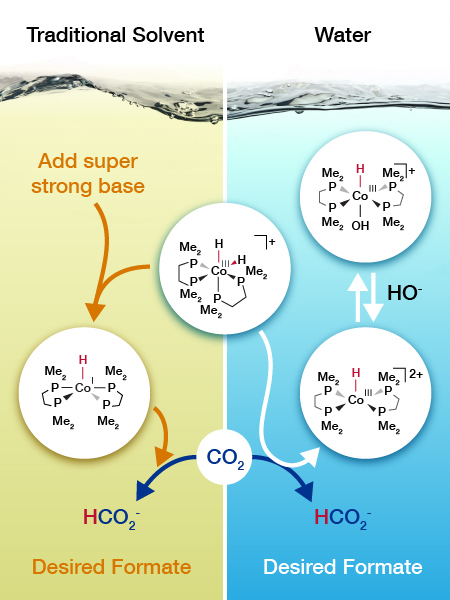 Catalysis researchers determined that the cobalt-based catalyst (center) takes a different path to adding hydrogen to carbon dioxide depending on whether it is in water or another solvent. Image: Nathan Johnson, PNNL Enlarge Image. Working under good conditions makes it easy to get a job done. But what if you could turn good to great? That's what scientists did for a popular catalyst that drives the conversion of carbon dioxide into a chemical feedstock known as formate. A cobalt-based catalyst drives the reaction in a solvent with a super strong base that is expensive. With some back-of-the-envelope calculations, Dr. Eric Wiedner and his colleagues at DOE's Pacific Northwest National Laboratory predicted that the cobalt catalyst could take a different reaction path to work in water with inexpensive sodium bicarbonate, commonly known as baking soda. The result? The catalyst is the best performing nonprecious metal catalyst for converting carbon dioxide in water. "By using thermodynamic predictors to design catalysts, we've avoided the shotgun approach and the associated time and cost," said Wiedner. "We understand how to control the catalyst thermodynamics, and now are able to extend our findings to design new catalytic systems." Why It Matters: The team's work shows that the reaction environment, including the catalyst, solvent, and base, strongly influences the reaction. In this case, the surroundings determine how the reaction will proceed. Understanding the influence of the environment is crucial to designing the best catalysts. And the best catalysts are needed to transform carbon dioxide into a chemical that can serve as a building block for manufacturing hydrocarbon fuels and chemicals. Summary: What if carbon dioxide could be used as a feedstock for valuable chemicals? The molecule would be turned into a hydrocarbon building block. How? By first adding hydrogen to create formate (HCOO-). A big challenge is finding a catalyst system that can drive the reaction without relying on expensive chemicals. A research team at Pacific Northwest National Laboratory devised a cobalt-based catalyst system that works in water. The catalyst is the best when it comes to driving the reaction in water without relying on precious metals or expensive bases. 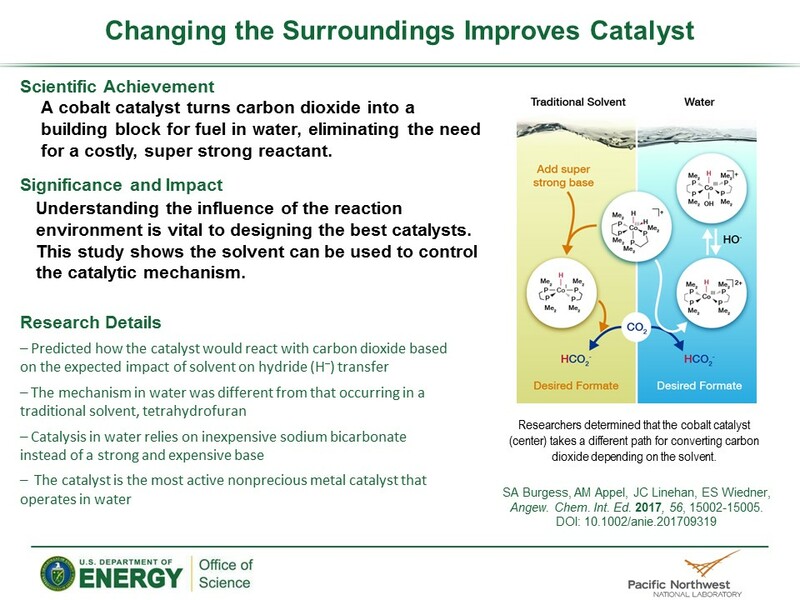 The team predicted how the catalyst would react with carbon dioxide based on the expected impact of solvent on hydride (H-) transfer, with the goal of working in water. The mechanism was different from those occurring in the traditional solvent, tetrahydrofuran. The resulting mechanism relies on inexpensive sodium bicarbonate instead of a strong and expensive base. Guided by the predictions, the team tested the catalyst in water with carbon dioxide. They characterized the catalyst's performance by high-pressure nuclear magnetic resonance spectroscopy using a customized cell developed and built at PNNL. "This is a rare and powerful technique in the catalysis community," said Wiedner. The team's analysis demonstrated that the catalyst had worked just as predicted.